Apr 01, 2019: Following stats were released by Ministry of Commerce & Industry, Department of Industrial Policy & Promotion, Office of the Economic Adviser. 2. 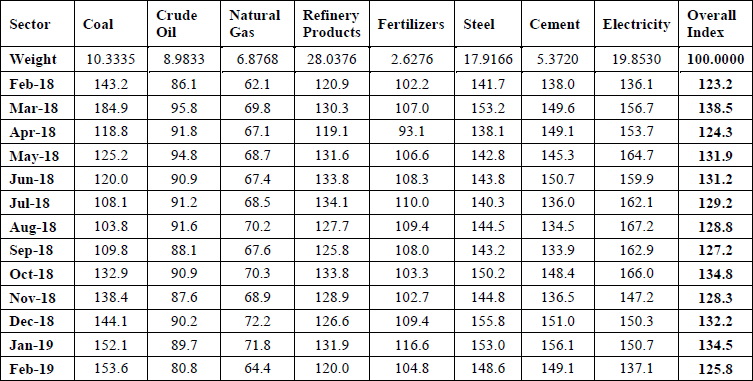 The Eight Core Industries comprise 40.27 per cent of the weight of items included in the Index of Industrial Production (IIP). 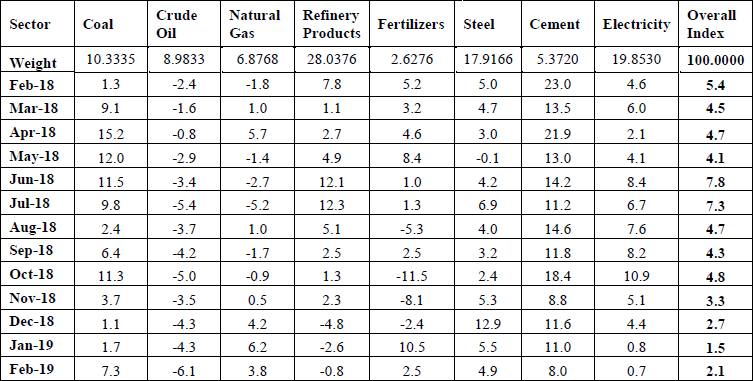 The combined Index of Eight Core Industries stood at 125.8 in February, 2019, which was 2.1 per cent higher as compared to the index of February, 2018. Its cumulative growth during April to February, 2018-19 was 4.3 per cent. 3. Coal production (weight: 10.33 per cent) increased by 7.3 per cent in February, 2019 over February, 2018. Its cumulative index increased by 7.1 per cent during April to February, 2018-19 over corresponding period of the previous year. 4. Crude Oil production (weight: 8.98 per cent) declined by 6.1 per cent in February, 2019 over February, 2018. Its cumulative index declined by 4.0 per cent during April to February, 2018-19 over the corresponding period of previous year. 5. The Natural Gas production (weight: 6.88 per cent) increased by 3.8 per cent in February, 2019 over February, 2018. Its cumulative index increased by 0.8 per cent during April to February, 2018-19 over the corresponding period of previous year. 6. Petroleum Refinery production (weight: 28.04 per cent) declined by 0.8 per cent in February, 2019 over February, 2018. Its cumulative index increased by 3.0 per cent during April to February, 2018-19 over the corresponding period of previous year. 8. Steel production (weight: 17.92 per cent) increased by 4.9 per cent in February, 2019 over February, 2018. Its cumulative index increased by 4.7 per cent during April to February, 2018-19 over the corresponding period of previous year. 9. Cement production (weight: 5.37 per cent) increased by 8.0 per cent in February, 2019 over February, 2018. Its cumulative index increased by 13.0 per cent during April to February, 2018-19 over the corresponding period of previous year. 10. Electricity generation (weight: 19.85 per cent) increased by 0.7 per cent in February, 2019 over February, 2018. Its cumulative index increased by 5.4 per cent during April to February, 2018-19 over the corresponding period of previous year.